The good news? It turns out that while Dice or Die is like 2048, it is also different than 2048, and even better news? It improves on the genre. Though to be fair it took a bit of play before we fully understood that fact. 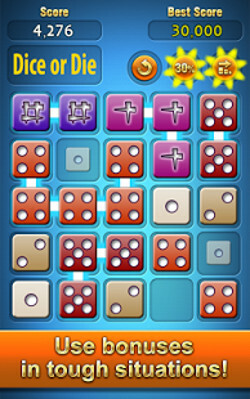 Dice or Die was created in the sliding block puzzle genre and the tabulation puzzle sub-genre, and offers the player two skins with which to play - the primary skin serves the blocks up as dice while the alternate skin serves them up as numbers. 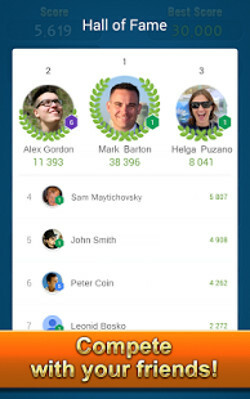 Anyone who has played 2048 knows that the objective is to combine like-numbers into larger numbers until you obtain a target amount, and to continue to do so for as long as you can. In terms of cost, the game is free-to-play and free-to-download - though right now it is available for Android and we don't know if there are plans to release it to other OSs. The only revenue stream that we saw was a modest ad for other games that rotates onto the screen when you have reached the end of a game and start a new one - but the ads are not intrusive and are easily dismissed. 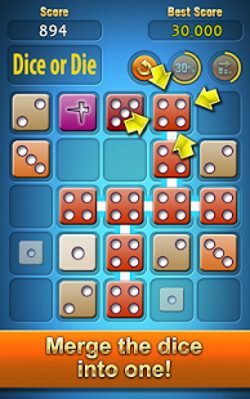 The beauty of Dice or Die is that like the game it was clearly influenced by, it offers the player a game play experience that is at once addictive and entertaining, and easily fills all of the available time for play. The important thing though is that it was created as a mobile app/game, which means the player can easily suspend play and walk away as needed, making it a good fit for catch-as-catch-can play! The graphics and sound effects in the game are top-notch when you consider it is a free play - and what we mean by that is simple: real effort was put into creating an eye-pleasing and well-polished graphical environment for the game - much more effort than one typically expects to see in a free-to-play title. We really liked Dice or Die - and more important we are sure you will as well. So if you are an Android gamer and you are looking for something new and entertaining to fit into your game play rotation for mobile app/games, Dice or Die is a good fit and one we are happy to recommend. 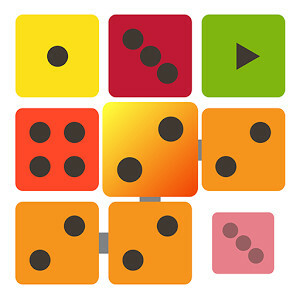 New, polished, mind-bending, minimal puzzle ..
Flow Free is a simple yet addictive puzzle ..